Winny brought along cupcakes with musical notes that she had prepared herself. Through Winny’s contribution, we can see the passion inherent in the Pianovers community! Thank you, Winny, for your cupcakes! Also, this evening’s Mini-Recital featured many classical pieces which was a good contrast to the previous Meetups. Stella played Jingle Bells, which was published in September 1857 under the title "One Horse Open Sleigh" and performed in Boston that year. It was originally intended for the Thanksgiving season but over the years became associated with Christmas instead. Today, Jingle Bells is a popular Christmas song sung by families around the world. The use of classical music in classic cartoons started in the 1930s and spawned a whole new learning process for children and adults alike. For example, an episode of Tom and Jerry, the popular cartoon depicting the cat and mouse in a perpetual chase, titled The Cat Concerto, features one of Liszt’s works - Hungarian Rhapsody No. 2. After Erika’s performances, we had an intermission and took this opportunity to celebrate Isao’s birthday. It fell on Sunday, that very day of the Meetup! Isao Nishida joined us since Meetup #14. Unfortunately, he was scheduled to return soon. He was a frequent sharer during the weekly Meetups and many Pianovers gained valuable knowledge from his sharing. He also participated in many events and the bond he established with fellow Pianovers went far and deep. To celebrate Isao’s birthday, Elyn brought along a birthday cake, which totally surprised Isao! All of us sang Happy Birthday happily, and cut the cake. Happy Birthday, Isao! ThePiano.SG’s vision is to be the leader in connecting people in the piano community. Far from being just an online portal, ThePiano.SG conducts face-to-face events that allow pianists, piano music lovers and just about anybody related to the piano to meet, bond and network. Two months ago, Pianovers Meetup was featured in the Challenge magazine, the publication of the Public Service Division under the Prime Minister’s Office. It is then, truly, a feather in the cap when Pianovers Meetup has now been featured in the national daily, The Straits Times! From South Korea, Jaeyong is in Singapore for holidays until December. A true piano enthusiast, he has been indulging himself in playing the piano during his stay here. Although Jaeyong is only here for a short period, he has formed a bond with Pianovers through Pianovers Meetup. We hope to know him better and that all of us are able to learn from one another and expand our knowledge. Jonathan played Montagues and Capulets by Sergei Prokofiev. This was the first one in the Suite No. 2 from Romeo and Juliet, Op. 64ter, a ballet written by Sergei Prokofiev and based on William Shakespeare's play Romeo and Juliet. Interestingly, "Montagues and Capulets" was related to death, and was used as the Introduction of Act III, that was played after the fatal duel between Mercutio and Tybalt. To coincide with the arrival of the Mid-Autumn Festival, Pianovers Meetup #51 was a mooncake-themed one. Held at the residence of Junn, one of our Pianovers, this was a special event that saw people arriving in their traditional attire. In the spirit of the Mid-Autumn Festival, some Pianovers arrived with mooncakes. Others came with presents and red packets for Junn’s newborn, Beatrice. We Pianovers would like to thank Junn for her kind hospitality and for being such a wonderful host! Jonathan performed his original composition, Heisō (並走) - Japanese for “running in parallel” or in a different context, “mutual fate”. This song was inspired by a scene where two star-crossed lovers boarded two trains that ended up running parallel to each other. This created a fleeting, haunting moment of eye contact between the lovers. Jonathan's piece would tell the story of the lovers’ parallel, almost-identical lives and lamentable truth that they would never meet again. Jonathan creatively expressed this by using, in his words, “the thematic 7ths to evoke a feeling of ‘near yet impossible completion’”. As an important step in giving back to society, ThePiano.SG has rolled out a social initiative known as Pianovers Assist which provides assistance to needy Singaporeans so that all Singaporeans, regardless of their financial background, can benefit from the best opportunities in piano education. Zafri was the first beneficiary under the Pianovers Assist programme. Owing to the fact that this Meetup session happened during the September school holidays, the turnout tonight was huge, and list of performers was long. As if this was pre-planned, the lights at The URA Centre were switched off right after the last note from the last performer! Such was the great timing! Everyone present cheered! We were all clearly happy that no one who had registered to play was left out. In old Europe, there were not individual private piano lessons. Everything was taught in small groups. The reason is that one learns so much more when one observes the teaching and one is not involved in the playing at the same time. Pianovers were updated with two pieces of news. Yamaha Music Asia has partnered with ThePiano.SG, during Yamaha's Piano Fair 2017, on ThePiano.SG's piano donation program "Pianovers Assist" for those in needs, where a beneficiary gets to keep a piano for 6 months free. Also, Pianovers Meetup #49 will be held at the Suntec Convention Centre, Room #333, on 10 Sep, 2pm - 4:30pm, in conjunction with Yamaha's Funtastic Piano Days. The pianist swims his way into the seat before a grand piano, while the three accompanying violinists stand around him. The music soon starts, with Andre Kempen hitting the ivory keys and the violinists playing along, all breathing air bubbles as they serenade underwater. On 20 August 2017, Pianovers gathered at 10 Square @ Orchard Central for a special event, Pianovers Recital, to celebrate the first anniversary of Pianovers Meetup. Everyone had a very enjoyable evening full of piano music and more! Pianovers Recital was but a small step towards our vision of connecting people in the piano community; and we look forward to an even better Pianovers Recital 2018! Hua Shin and Yee Ling, both new to Pianovers Meetup, performed one of the pieces from their upcoming concert, to be held on 5 Sep 2017. Yen-Fay and Ming Yang, who attended the Meetup last week, were back to perform the same pieces for a good reason - they are participating in the Singapore Asia Youth Piano Competition on 19 Aug 2017! 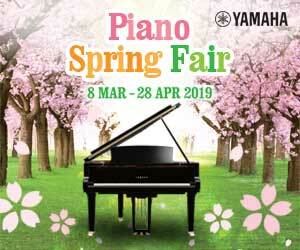 We at ThePiano.SG would like to wish them all the best in their concert and competition! As this Meetup was conducted just three days prior to National Day, it was appropriately National Day-themed. To mark this occasion, Pianovers tonight came in either red or white. The Mini-Recital this evening was split into two halves, the second half carrying a National Day theme. The many wonderful performances culminated in Zafri's performance of the most important song of all - Singapore's National Anthem. Kris (Australian), was spotted chatting with Desiree (Indonesian) and her daughter, as well as Albert, an elderly Pianover (Singapore). Zafri (Malay), and Pat (Chinese) were seen jamming together. In another interesting observation, May Ling (Chinese) was chatting with Ploy (Thai) and Wayne (Hong Kong). These random interactions illustrated one important point. Pianovers Meetup is not just about bringing people together in the piano community, but also about strengthening the Singapore spirit. The event builds social cohesion and promotes racial harmony. Through Pianovers Meetup, people of all races, languages and religions come together to indulge in this commual space to make music. Isao performed All By Myself, a piece by Eric Carmen in 1975 whose verse is based on Rachmaninoff's Piano Concerto No. 2 in C minor, Op. 18. When Carmen composed this piece, he was under the impression that Rachmaninoff's music was in the public domain and there were no copyright claims on it. After the album’s release, however, he was contacted by the Rachmaninoff estate and informed otherwise. The two parties reached an amicable agreement, under which the estate would receive 12 percent of the royalties from all sales of the "All by Myself "album. Researchers have established a link between playing sounds to the positive treatment of and relief from stress and ailments like Parkinson’s Disease and hormonal problems. People who have had problems speaking have also been healed with the help of music. In today’s modern, fast-paced world, where stress takes its daily, unrelenting toll on us, it may be worthwhile to take a step back and explore sound’s healing effects.